#Start the system to test your configuration - do screen and buttons work OK? Stop the ZPUI service (to prevent it from grabbing the input&output devices), using sudo systemctl stop zpui.service. Such a workflow is suggested to allow experimentation while making it harder to lock you out of the system, given that ZPUI is the primary interface for ZeroPhone and if it’s inaccessible, it might prevent you from knowing its IP address, connecting it to a wireless network or turning on SSH. In documentation, /opt/zpui will be referred to as system-wide copy, while the directory you cloned the repository into will be referred to as local copy. To get new ZPUI changes from GitHub, you can run “Settings” -> “Update ZPUI” from the main ZPUI menu, which will update the system-wide copy by doing git pull. If you want to sync your local copy to the system-wide copy, you can run update.sh It 1) automatically pulls new commits from GitHub and 2) copies all the changes from local directory to the system-wide directory. To avoid pulling the new commits from GitHub when running ./update.sh, just comment the corresponding line out from the update.sh script. For testing configuration or development, you will want to launch ZPUI directly so that you will see the logs and will be able to stop it with a simple Ctrl^C. In that case, just run ZPUI with sudo python main.py from your local (or system-wide) directory. 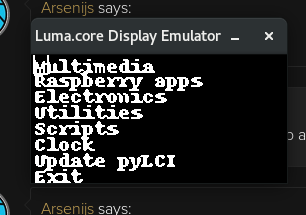 If you want to develop ZPUI apps, but don’t yet have the ZeroPhone hardware, there’s an option to use the emulator with a Linux PC - the emulator can use your screen and keyboard instead of ZeroPhone hardware. The emulator works very well for app development, as well as for UI element and ZPUI core feature development. Most of the emulator research and work was done by Doug, and later refactored by Brian Dunlay. The input driver was done by Arsenijs. OpenSUSE instructions were compiled with help of piajesse. Arch Linux instructions were compiled by monsieurh.